For your convenience, the included drive has been SoftRAID pre-certified and formatted for use with the Mac OS. 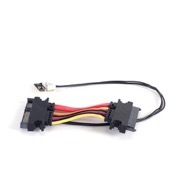 Rating: 5/5 Great upgrade for your old iMac November 16, 2018 This kit saved me from buying a new iMac and allowed me to continue my work within 2 days. Thanks MacSales!! Highly recommended upgrade. The replacement was a little trickier than the old ones for the old iMacs with the magnetic screen cover but the videos are clear and straightforward and tell you exactly what you need to do step by step. Be sure to remove all the old double faced tape for the best results or your screen will fall off. You'll be happy you upgraded. Rating: 5/5 Repair skill level better be high. June 10, 2018 Great kit it sets you up for success the stickers fit perfectly in place. I wouldn't suggest this repair if you don't have any experience repairing Apple Computers your inexpensive repair can get real expensive if you damage or break the glass of LCD. I suggest using blue painters tape to hold the display in place to test your work before you seal up your mac with the high bond tape. Rating: 5/5 No Problems! April 30, 2018 I was super nervous taking the screen off my 27" 2012 iMac, but with the quality pizza cutting tool from OWC, the screen separated without incident. Watch the video, take your time, and have a helper nearby to pass tools, etc. I was looking for the same quiet machine I originally bought, and the OWC kit delivered! Rating: 4/5 Worked Great - about an hour March 15, 2018 This worked great & I was comfortable doing this repair myself. Instructions were terrific. Minor Gripe: the adhesive strips were a bit touchy/stretchy. Rating: 5/5 Mac upgrade made easy! January 25, 2018 I was a little bit concerned about doing the upgrade to my Mac, but this was fairly easy if you're good at following instructions and not rushing things. Watch the video more than once before buying the upgrade kit. The video makes it looks easy where anybody can do it. If you take your time (a little over an hour) and pay attention to what you're doing, it should be easy. Rating: 5/5 Easier than I thought! January 18, 2018 I was a little nervous about doing the install myself when I learned that you had to split the adhesive on the display to open the iMac 27". However, the process proved to be easier than I thought, and the tools and kit worked really well. All you really need is to have the ability to be a little meticulous, and you'll do fine. Now I've got more than twice the space offered by Apple, at 1/3 of the price. Drive is absolutely silent, even when working. Rating: 5/5 Saved my iMac January 9, 2018 Perfect kit to bring my late 2013 2-inch iMac back to life. Video instructions found on this website were great. Tools worked well. Sticker kit for the display also worked well. Rating: 5/5 Excellent Packet for HD Replacement November 16, 2017 Hi was a little concerned about trying to replace a HD in a iMac I purchase, but didn't want to pay the $850-$1000 that Apple would charge. The was great and the online video instructions was terrific. I recommend you watch the instruction video a lot before starting. I was able to do the upgrade and my system is working perfect! 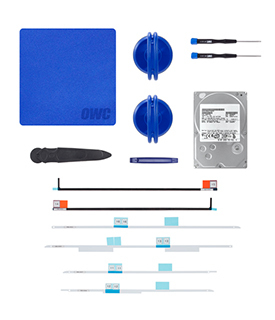 Rating: 5/5 Helped me replace my hard drive perfectly August 21, 2017 I am happy to give this DIY kit high marks. It was worth it to me to have the correct tools and especially nice to have the correct and well thought out replacement adhesive tape for the screen. The video that is on the website made it a piece of cake to do this work inside my computer. It works as promised and from past experience I know that had there been a faulty part OWC would have replaced it. Rating: 5/5 Worked great July 26, 2017 The disk drive part of my Fusion Drive failed on my iMac. This kit and the accompanying video worked great! Took my time on glass and it was fine. After that it was easy. After the physical drive replacement I used disk utility to format the new drive and restore from a external HD backup. I would recommend the kit. Now have a 6TB fusion drive instead of my old 3TB, got a great upgrade out of a original equipment failure (late 2013 iMac 27").